One part crib, one part play yard, our travel crib is the two-in-one solution for parents on-the-go. Perfect for weekends at grandma's, family vacations and more, this innovative crib comes with a mattress pad and sheet for naptime and bedtime. Ready to play? 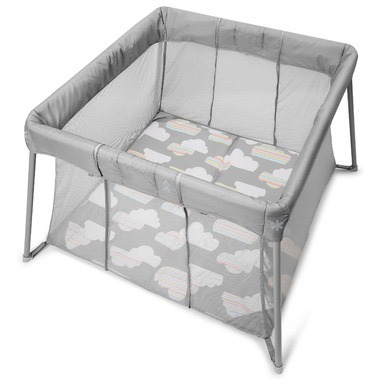 Just unzip the sides to convert the crib to a roomy enclosed playspace. We even included a comfy, wipe-clean mat with a decor-friendly print. Breathabe mesh fabric sides give parents and baby a clear view. Easy to fold-up, the travel ready design packs into its own bag so it's a cinch to grab and go (or store between trips).